How about a post of randomness? Those are my favorite anyway really. 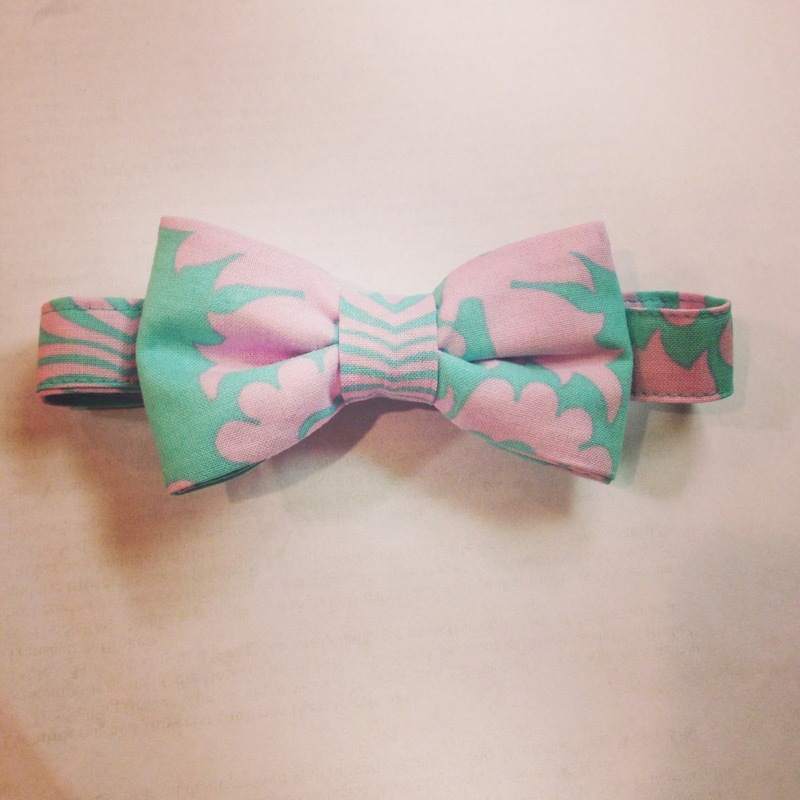 I am so in love with this bowtie I ordered for Manny for Easter. I knew I wanted something to match Maeva's dress, so I started looking on etsy. I couldn't find anything in the fabric I wanted, so I just messaged several people that were selling bowties and asked if they could do a custom order. Lisa from LiliBug Boutique was one of the first to respond, and said though she didn't have the fabric, she'd be glad to order it and make one up for me. That was on Sunday night. And the bowtie arrived on Saturday! On top of that? She didn't even charge me extra for a custom order. This bowtie was only $10 (plus $3 shipping) and it is so well made! I have purchased many bowties for Manny - some as expensive as $30, and this one is right on par with the quality. I was not asked to write about this, but when I find a vendor with excellent products, wonderful customer service, and great price point? I feel it's a crime not to share. 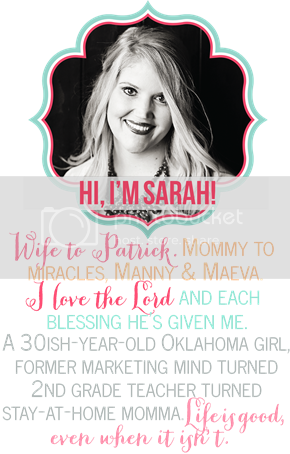 :) Check out her shop here, and if she doesn't have what you're looking for just convo her. The other day I was doing our daily weekly grocery shopping, when Manny spotted this little thing on the bread aisle at Wal-Mart. Basically it's a gimmicky product, but let's be honest - those are my favorite, and I see he's the same way. It slices the hot dog up, and has a little dipping bowl for ketchup. Manny's diet would consist solely of turkey dogs if it were up to him, so this was a must. To say he's obsessed with this would be an understatement. I mean, he likes to play with it even when there's not food in it. Here it is on Amazon, but it costs more. It was $3.98 at Wal-Mart. And yes, I'm aware I'm a sucker. There's a reason I can't watch the home shopping network or infomercials. Speaking of such, my friend Kellie told me about their Slushy Magic and I could barely get to Target fast enough to pick one up. (Here it is on Amazon if you can't find it at a store near you.) It is just a plastic cup that comes with reusable ice cubes that have salt water in them - thus the freezing action. You pour your drink in on top of the frozen cubes, then put the lid on and shake for 3 minutes. I usually go a little longer than that, and leave the cubes in it while we're eating it and that seems to help the slushy consistency. Our favorite is just pouring chocolate almond milk in. A fun treat! This thing takes me back to the days of my Snoopy Snow Cone machine. Anyone else? 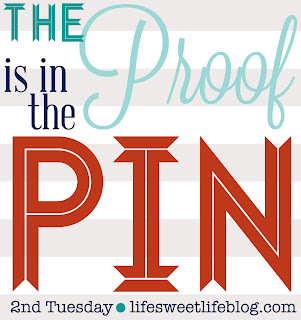 And finally, a reminder that Proof is in the Pin will be up this Tuesday! 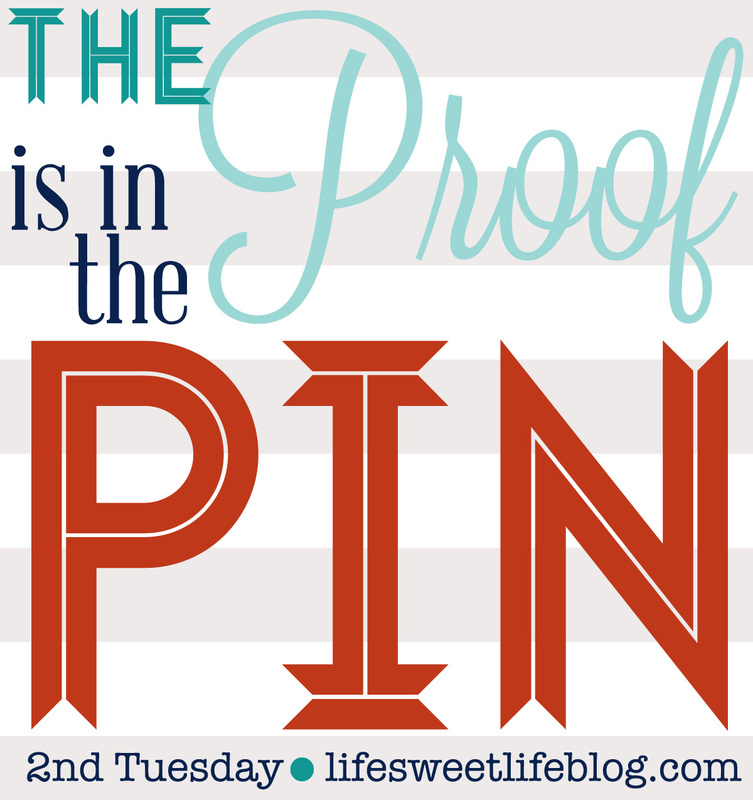 Have you completed any of your pins from Pinterest lately? If so, tell us about it and come link up on Tuesday. More details here. He is going to look SOOOO cute in that bow tie!!! STOP IT! The slushy magic actually works?!?!?!? Dang it. I need it now. Bebe Sawyer!!! 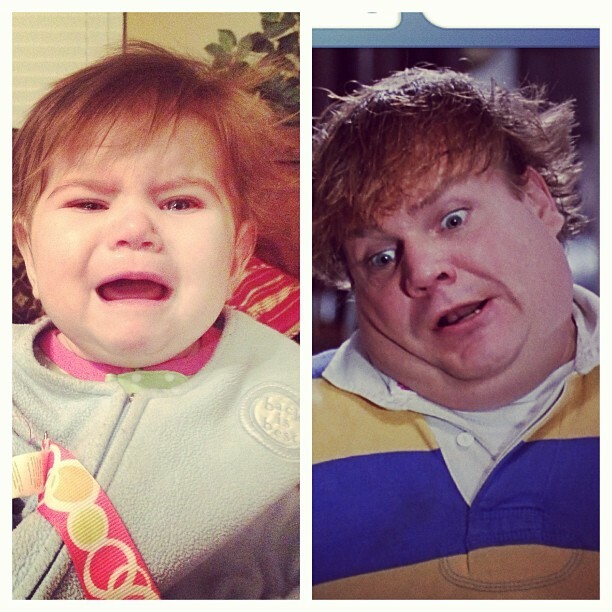 I'm dying at that comparison- she looks just like him in that pic! Seeing Manny's tie has piqued my interest about what Miss Maeva will be wearing for Easter! I bet cuteness will abound. 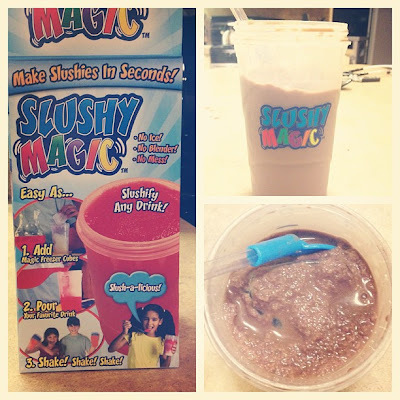 My kids would love the slushy magic! I may have to make a trip to Target. 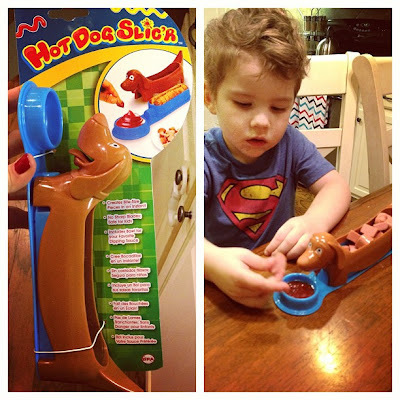 If my kiddos were younger I would SOOO buy that hot dog slicer! Almond chocolate milk in the slushy magic? Oh geeze I gotta go get one now!Are y'all only Almond milk drinkers? We just made that switch. Awww, the memories of the Snoopy Snowcone maker!I still have mine! Tommy Boy and Bebe Sawyer...funny! Hayden would be so jealous of the hot dog thingy. He begged me to buy it for him at Wal-Mart the other day. It looks pretty cute, so I may have to surprise him with it. He too is a hot dog junkie!